Texas Instruments announced in May 2007 with the TI-30XS MultiView the successor of its long lasting TI-30X IIS introduced already in 1999 and slightly redesigned in 2004. In February 2008 followed with the TI-34 MultiView and TI-Collège Plus the successors of the TI-34 II resp. TI-Collège. And another two years later, in May 2010, we heard about the TI-30X Pro MultiView and thought immediately about the TI-36X II. We received the first actual calculator in October 2010 and have to admit: This scientific calculator is the real successor of the TI-68! Even the keyboard is similar cluttered, but the new multi-tap feature avoids at least a [3rd] or even [4th] key to access the zillions of functions implemented in the single-chip calculator circuit. 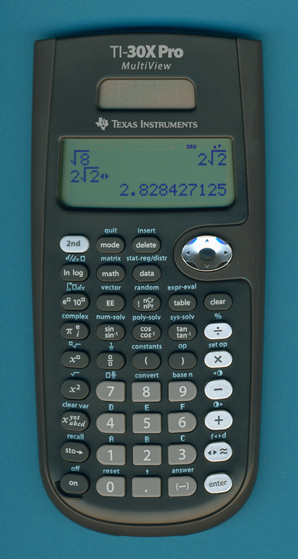 Instead of the then novel 2-line display the TI-30X Pro MultiView features a dot matrix display with 31 * 96 addressable pixels allowing the calculator to display equations as they would be printed in a text book. Dismantling this TI-30X Pro MultiView manufactured in June 2010 reveals a pretty common construction with two printed circuit boards (PCB's). The main PCB hides the single-chip calculating circuit under a small protection blob of black epoxy and drives the graphing display with a heat sealed fine-pitch connector. The keyboard makes use of a much simpler second PCB and a heat sealed connector, too. The prominent SR-21 designation on the main PCB proves that this calculator was manufactured by Kinpo Electronics, Inc., a famous company located in Taiwan and doing calculator production for well established companies like Texas Instruments, Hewlett Packard, Casio, Canon and Citizen. Texas Instruments announced the TI-30X Pro MultiView in May 2010 in some European countries and it finally hit the shelves in September 2010. Only a few weeks later, early in October 2010, the German website of Texas Instruments' calculator division announced an important information for customers of the calculator. The 2-page document describes a serious problems of the new equation solver and a minor problem with the Planck's constant. Good for the Datamath Calculator Museum - we received the featured calculator early in October with the help of a friend visiting Austria before the shelves were emptied again. Thanks, Namir! x1=0.5, x2=-1, and x3=2. The correct answer is x1=0.5, x2=-1, and x3=0! The TI-30X Pro MV stores for 20 physical constants both NAMES and UNITS. The Planck's constant, denoted h, sports two errors: The name of Max Planck, one of the founders of quantum theory, is spelled Plank in the English manual and the unit is given in Joule per second (J/s) instead of Joule seconds (Js) on the calculator. The re-launch of the TI-30X Pro MultiView was delayed several times but in April 2011 the calculator was at least in Germany back in the shelves. A few weeks later in May 2011 an almost identical calculator was marketed in the United States as TI-36X Pro. And yes, the bugs are fixed. Don't miss the TI-30X Plus MultiView with another "bug". Texas Instruments announced on February 20, 2018 at the didacta 2018, an Education Trade Show in Germany, with the TI-30X Plus MathPrint and TI-30X Pro MathPrint the stylish successors of both the TI-30X Plus MultiView and TI-30X Pro MultiView. © Joerg Woerner, October 22, 2010. No reprints without written permission.